This touring production originates from Leicester’s Curve theatre, a place with a growing reputation for the excellence of its musicals – and this one goes all out to uphold that reputation. The story will be familiar to fans of the Whoopi Goldberg film comedy, but the score does not use the same old songs. Alan Menken’s vibrant original score pastiches the music of the era (the action is transposed from the 1990s to the 1970s) and gives the show its own musical identity. Leading the cast as sassy club-singer-turned-fugitive Dolores, is TV talent show alumnus Alexandra Burke. Her singing voice is heavenly but she also proves herself an accomplished comic performer, physically as well as vocally. Lighting up the stage whenever she appears (and she is rarely off) Burke is a revelation (but not the bad kind from the Bible!) and an utter joy to behold. She is supported by a fine ensemble of actor-musicians who carry their instruments around like fashion accessories. Among the nuns’ chorus, Sarah Goggin’s postulant Sister Mary Robert has the most developed character arc, growing from shyness to full-on belt. There is something inherently comical about nuns, and this show gets a lot out of this without resorting to off-colour gags about cucumbers or soap in the bath. These nuns are funny, individualised along the lines of the seven dwarfs: there’s the old one, the happy one and so on. Karen Mann’s Mother Superior is a powerful stage presence and her solo numbers are masterclasses in musical theatre. Aaron Lee Lambert is afro-sporting villain, Curtis, with a rich, chocolatey voice, contrasting with Joe Vetch’s good guy cop Eddie. Their songs range from old-school r&b to disco – oddly, perhaps for a show directed by Craig Revel Horwood, the numbers are not saturated with choreography. Horwood uses the 70s moves sparingly, so the Travolta-moves lift the songs when appropriate, without becoming parodies of themselves. Matthew Wright’s set keeps the ecclesiastical interior throughout, dressing it with disco stairs or police cell bars as the plot requires, in an economical and effectively emblematic fashion, allowing the action to flow seamlessly from scene to scene. Behind the scenes, the band fills out the sound of the onstage performers. Led by MD Greg Arrowsmith, this tight combo does as much to raise the roof and our spirits as those we can see. An unadulterated pleasure from alpha to omega, this is a joyous night at the theatre, energising and uplifting as only live theatre can be. Perhaps the best of the trend for adapting films for the musical stage, Sister Act has everything you could pray for in a show. A director’s chair in a spotlight. A director under scrutiny. David Rudkin’s beautifully written play is not exactly a biography of Alfred Hitchcock but a series of glimpses into his history and into his mind. As the story unfolds we begin to see the bigger picture and there are Freudian clues to why he was the way he was, and why he made it his life’s work to shock and scare cinema audiences. Through monologues and two-handers, Rudkin interlaces ideas and we make the links. This is no lecture or straightforward biopic. Like a Hitchcock piece, there is a slow build to its surprises, a twist or two on the road to psychological revelation. Martin Miller is a very strong lead as Hitchcock, speaking in terms of a shooting script he is forever forming in his mind. With just a few words, he paints pictures in our imagination – the economy of narrative theatre. Behind him, silhouettes appear on a gauze – his mother is first revealed as a shadowy figure saying Boo to her little boy to make him jump. As Hitchcock’s mother and then as his wife, Roberta Kerr is utterly compelling. Unlike Miller, she is released from the added pressure of having us scrutinise her portrayals for recognisable traits. Solid support comes from Anthony Wise as a priest, a teacher and, especially, a sleazy stranger on a train – sorry, strangler on a train; and Tom McHugh impresses as a young screenwriter, trying to keep abreast of Hitchcock’s creative whims. Asuza Ono’s lighting shapes the scenes on this Spartan stage, with touches of Caravaggio highlights and, of course, cinematic glows. Jack McNamara’s direction keeps the distinction between the inside and outside of Hitchcock’s mind clear. We are included in the action but not privy to all the secrets all at once. McNamara gives us suspense, intensity and humour – the hallmarks of a Hitchcock film. There are plenty of nods and references to Hitchcock’s oeuvre for the fan to spot and recognise. This small-scale touring production from New Perspectives and Leicester’s splendid Curve deserves wide-scale acclaim and a much larger audience. This brand spanking new musical, fresh out of the box for its world premiere performance, tells the story of playwright J M Barrie and the events that led him to create one of the most enduring stories in popular fiction. A shipload of money had been spent to bring this show to the stage. Production values are higher than the second star to the right. A lot of money and the latest technology to create a show that looks, sounds and feels old-fashioned – and I mean that in a good way. From the beginning we are pulled into a world of storybook illustrations from the beginning of the 20th Century. It occurred to me – and it’s not an original thought – that the musical is a fantastical form to begin with – the conventions of bursting into song, of scenery gliding in and out – the characters are already in an enchanted world. So, when we enter the world of J M Barrie’s imagination, things had better be pretty spectacular or we won’t notice the difference. Spectacular is only the half of it. There is a pirate ship that sails onto the stage to close the first act, that is absolutely beautiful. In fact, Scott Pask’s scenic design and Paul Wills’s costumes are superb, and the video projections by Jon Driscoll and Gemma Carrington enhance the action rather than distracting from it. The songs (by Michael Korie and Scott Frankel) reminded me of Robert & Richard Sherman, the brothers who wrote so many wonderful hits for Disney: “When You Believe It” has more than a touch of Mary Poppins about it, and I was also reminded of Chitty Chitty Bang Bang several times before Barrie acquires his first automobile. In context and as a whole, the score is perfectly charming and the lyrics witty and character-revealing, but I wonder if any of the numbers will emerge as stand-alone hits. A musical needs at least one hit song. The cast is perfect. Julian Ovenden is in fine voice as the naive Barrie, whose imagination is ignited when he meets the Llewellyn-Davies boys in Kensington Park. He strikes up a friendship with their mother, Sylvia (Rosalie Craig – who, like La Traviata, is able to belt out a good refrain while dangerously ill); the four boys are splendid. Harry Polden’s Peter is confident and touching, but all four of them strike the correct balance of charm and amusement. Rob Ashford’s direction keeps us on the right side of sentimentality, bringing together technical elements and actors’ performances to create a sumptuous feast for the eyes and ears. For me the stand-out moment is a Jekyll and Hyde confrontation between Barrie and his darkest creation, Captain Hook (a delicious performance by Oliver Boot). They sing a duet and engage in swordplay in the perfect fusion of the real and the imaginary. It’s a glamorisation of what goes on in a writer’s mind, but brings some verve and vigour to the second act. As Tinkerbell is in the ascendancy, poor Sylvia’s light is dimming. Barrie’s marriage to Mary falls apart (Clare Foster is excellent as the long-suffering wife and music hall star). But while all this happening, something wonderful is being born. It’s a long time before we see Peter Pan – there’s a pared-down synopsis of the play – and throughout the piece I was wondering if we would see any flying… Of course, we do – I won’t say when it happens but when it does, it’s exactly right. It’s a dazzling, lavish production, amusing, touching and technically impressive. J M Barrie, presented here as a man-child who never grew up, not only creates his greatest work but also finds emotional fulfilment, a Lost Boy no more. Judging from the way this Pan is handled, I’d say producer Harvey Weinstein has found gold. 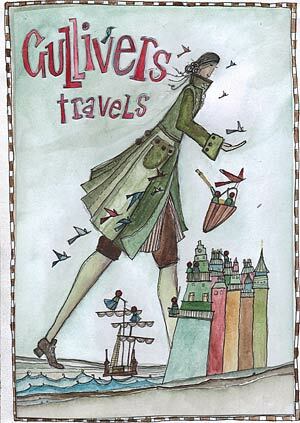 There are some people who think Gulliver’s Travels is a kids’ story. These people hardly ever see beyond the surface – or past the chapters concerning the Lilliputians. Happily, I am able to report that this Dragon Breath Theatre production covers the whole story and, while child friendly, deals with the grown-up issues and emotions contained within Swift’s story, which first appeared in 1726. In particular I was pleased to see the political satire intact and updated: the witty –and rhyming- script counterpoints Jove with the ‘almighty Gove’ as, in its most absurdist episode, on the flying island, the closed thinking of educational policy is exposed as ridiculous. Each of Lemuel Gulliver’s adventures presents technical challenges. How will they stage Lilliput? The Giants? The Houyhnhnms? Director Adel Al-Salloum rises to each challenge and deals with them with inventive and charming solutions. The tiny Lilliputians reminded me of the Tombliboos on In The Night Garden and the Houyhnhnms are horse heads on flexible rods, beautiful and graceful. The changes in scale are handled superbly. The ensemble of performers transform the simple shipdeck setting into spaces on which the audience can project imagined pictures conjured by Peter Rumney’s evocative and funny script. Lemuel Gulliver (Chris Jack) is emotionally and mentally disturbed – it’s quite harrowing to see him in this state as the play begins. Daughter Molly (Jennifer Welwright) urges him to speak and so he narrates to her (and to us) his tales of wonders. Chris Jack is an appealing Gulliver, the voice of reason in each mad land he visits. He learns lots about human nature and society – most of it negative. It’s not a pretty picture. The flying island’s policy of bombing people who disagree into submission is particularly disturbing and idiotic. Gulliver is stunned – he would pitch a fit if he knew that the world today, as run by humans, hasn’t changed at all since Swift’s day. As a foreigner in the land of the giants, Gulliver, a trained surgeon and educated man, is reduced to dancing on tabletops as a novelty act and regarded as sub-human. I’m sure many immigrant workers today would recognise this beastly treatment. Oh, technology has improved and fashion has got worse, but basically people and politics are still the same. The glimmer of hope for a better world comes in the Land of the Houyhnhnms, where horses rule over brutish humans (Swift gave us the word “Yahoo”). Here, conflict is disdained rather than sought. Gulliver longs to go back, despite the Houyhnhnms insistence that he is worse than Yahoo, because he can think and feel and yet is still bellicose and full of anger. The Houyhnhnms suggest we can rise above our baser instincts and aspire to Utopia. We are still a long way off, folks. Chris Jack is an appealing Gulliver, emanating warmth and narrating with a rich, evocative voice. Also impressive are Jim Findley and Becky Matter in a variety of roles, and Jennifer Welwright is touching as Molly and the giantess Glumdalclitch. Duncan Chave’s atmospheric music is delightfully performed by Yvonna Magda, and Nettie Scriven’s design is elegant and stylish. The costumes are beautiful, adding to the conjuring of Gulliver’s bygone era but above all, this absorbing and entertaining production reminds us of the state of our world today. We must not let the Yahoos and the mental midgets continue to have their way.